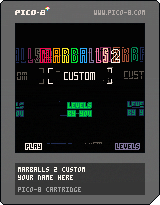 A sequel to Marballs, now with verticality, orbs and jump pads! Roll around with the arrow keys, jump with Z and use X to pause and restart. Use the pause menu (ESC or enter) to return to the main menu. To swap to 45° controls choose "swap controls" in the pause menu. Create and share your own levels using the custom cart!